This is the uncorrected proof of Tony Hillerman's 2003 novel The Sinister Pig. It is paperbound in pale blue with black printing. The front cover displays title, author name, and uncorrected proof notice. Inside front and inside back covers are blank. Title, author and logo are printed on the spine. 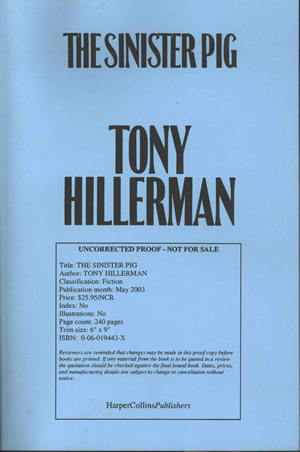 The back cover displays title, author name, synopsis, brief author biography, and Praise for Tony Hillerman.